A characterization of the Amphibian Bufo arenarum oocyte envelope is presented. It was made in different functional conditions of the oocyte: 1) when it has been released into the coelomic cavity during ovulation (surrounded by the coelomic envelope, (CE), 2) after it has passed through the oviduct and is deposed (surrounded by the viteline envelope, (VE), and 3) after oocyte activation (surrounded by the fertilization envelope, (FE). The characterization was made by SDS-PAGE followed by staining for protein and glycoproteins. Labeled lectins were used to identify glycosidic residues both in separated components on nitrocellulose membranes or in intact oocytes and embryos. Proteolytic properties of the content of the cortical granules were also analyzed. After SDS-PAGE of CE and VE, a different protein pattern was observed. This is probably due to the activity of a protease present in the pars recta of the oviduct. 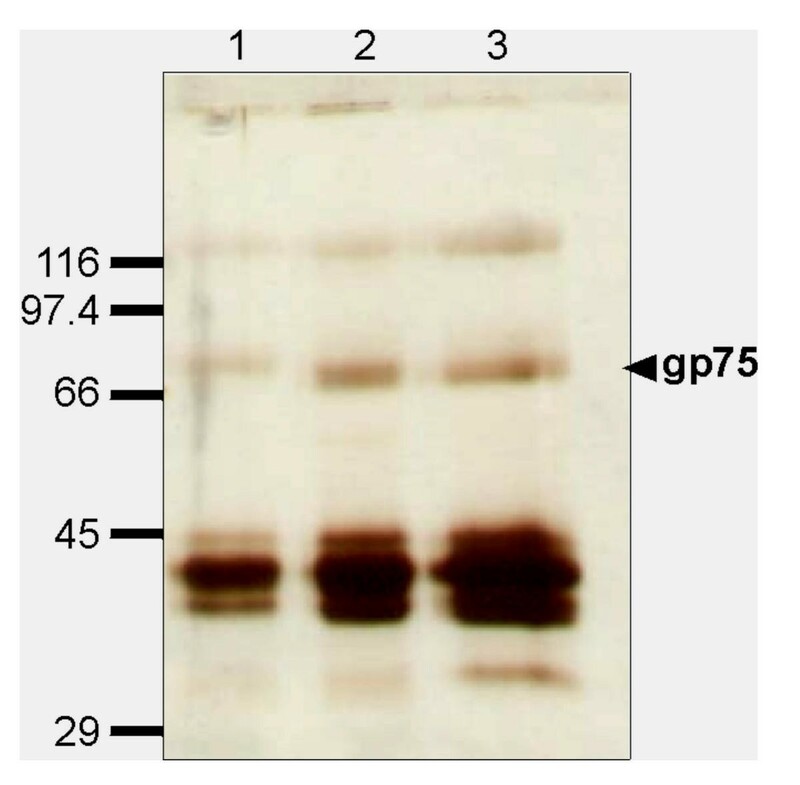 Comparison of the SDS-PAGE pattern of VE and FE showed a different mobility for one of the glycoproteins, gp75. VE and FE proved to have different sugar residues in their oligosaccharide chains. Mannose residues are only present in gp120 of the three envelopes. N-acetyl-galactosamine residues are present in all of the components, except for gp69 in the FE. Galactose residues are present mainly in gp120 of FE. Lectin-binding assays indicate the presence of glucosamine, galactose and N-acetyl galactosamine residues and the absence (or non-availability) of N-acetyl-glucosamine or fucose residues on the envelopes surface. The cortical granule product (CGP) shows proteolytic activity on gp75 of the VE. A very complex extracellular matrix surrounds oocytes in most animals. This envelope is called zona pellucida in mammals , chorion in fish , vitelline envelope in amphibians , vitelline layer in echinoderms  and perivitelline membrane in birds . The origin of this envelope is controversial because for some species it originates from oocyte secretions (mouse [6, 7] – reviewed by Wassarman et al , Xenopus laevis , human and hamster ) and in other species a double origin (oocyte and follicle cells) seems to be the case (rabbit , Bufo arenarum ). In birds, VE components have been shown to be synthesized by granulosa cells [13, 14]. and the liver . In teleost fish VE glycoproteins are provided by the liver . In any case, this structure is completely assembled when the oocyte is still in the ovary, and remains closely opposed to its surface during ovulation and is separated from the oocyte by the perivitelline space. Depending on the animal species, the envelope is not modified until oocyte is activated (sea urchin, fish, etc.) or interacts with oviduct secretions (amphibians) [16, 17]. The acquisition of egg fertilizability during transit through the pars recta portion of the oviduct in X. laevis is accompanied by proteolytic conversion of the vitelline envelope 43 kDa component to 41 kDa component induced by a protease, oviductin . This modification changes the VE's biological properties and the electrophoretic pattern of its components, rendering the coelomic oocyte fertilizable. Similar changes have been described and homologous mechanisms have been proposed for other species (R. japonica , B. japonicus , B. arenarum ). Following fertilization, or activation by other means, the cortical granule contents are released into the perivitelline space by exocytosis. The CGP then modifies the VE [3, 22, 23]. resulting in changes in its physicochemical behavior and its biological activity [24–26]. Once secreted, the proteins of the cortical granules modify the surface of the fertilized or activated egg, making it impenetrable to additional sperm and insensitive to several chemical reagents [10, 11]. The resulting FE remains unmodified until the embryo is released at hatching. This process is mediated by the action of a protease (hatching enzyme) released by the embryo . Four major glycoproteins have been reported in the VE of Xenopus laevis oocytes: gp120, gp69/64, gp41 and gp37 [3, 16, 28], while some minor components have also been reported [3, 29]. On the basis of sequence similarity to the ZP components reported thus far, and in agreement with the nomenclature proposed by Harris et al , they have been named ZPAX (gp120), ZPA (gp69/64), ZPB (gp37) and ZPC (gp41). The relevance of the VE glycoprotein carbohydrate components in sperm-egg recognition is well established in all species studied [31–34]. In the present work we further characterize the molecular components of the Bufo arenarum oocyte VE and the modifications it acquires following ovulation, deposition and activation. Sexually mature Bufo arenarum specimens were collected in the neighborhoods of Rosario and San Miguel de Tucumán cities, and kept in a moist chamber until used. Ovulation was induced as described . For the isolation of VE, oocyte strings were collected from the ovisac and hydrated in water. For the isolation of FE, oocyte strings were fertilized in vitro by the addition of a sperm suspension made by mincing testes in 10% Ringer and embryos were allowed to develop until the stage of 4–8 cells. For the isolation of CE, ovulated oocytes were recovered from the body cavity. After dejelling in 1% Thioglycolic acid in 10% Ringer Tris pH = 8.0, oocytes or embryos were homogenized in a Ringer-Tris (calcium free) solution using a Potter-Elvehjem homogenizer. The envelopes were recovered by retention in a 30-mesh nylon screen filter, were rinsed with the homogenizing solution and stored. All procedures were carried out at 0 – 4°C. To induce activation, dejellied oocytes were incubated with two volumes of Ringer, 10 mM Tris pH = 7.6. (Ringer-Tris) containing the calcium ionophore A-23187 at a final concentration 1 μM. After 15 min of gentle shaking at room temperature, the solution was decanted from the eggs. The eggs were washed with two volumes of 10% RingerTris pH = 7.6 and the exudate medium and washing solutions were combined and centrifuged at 40000 g for 30 min at 4°C. The solution was then dialyzed at 4°C against distilled water and freeze dried. The lyophilized proteins were resuspended in distilled water and named as Cortical Granules Product (CGP). The recovered product was between 500 μg and 1000 μg from 30,000/40,000 oocytes. Electrophoresis was carried out as previously described . Briefly, 5–10 μg protein from dissolved VE, CE or FE was submitted to SDS-PAGE using 10% gels under denaturing and reducing conditions . Proteins were electrotransferred to nitrocellulose membranes for 1 hour at 100 V or, alternatively, overnight at 30 mA. After transfer was completed, the membranes were washed in PBS, allowed to dry, and rehydrated in blocking solution (10% polyvinylpirrolidone in PBS). Membranes were blocked for 1 hour at room temperature and then incubated with lectin solutions. The lectins used in these experiments were from Canavalia ensiformis (ConA), Arachis hypogaea (PNA), Helix aspersa (HAA), and Triticum vulgaris (WGA). For PNA, HAA and WGA, peroxidase-labeled lectins were used at a concentration of 6 μg/ml in PBS pH = 6.8 containing 0.5 mM CaCl2 and 1 mM MgCl2. Membranes were incubated in the lectin solution for 1 hour at room temperature, washed 5 times for 5 minutes each with the same buffer and developed using DAB/H2O2. For ConA, membranes were incubated with non-labeled lectin (6 μg/ml), washed as above, incubated with peroxidase (5 μg/ml in the same buffer) and washed again before developing. Controls were performed by preincubating the lectin with their corresponding haptenic sugars for 30 minutes prior to incubation of the membrane. Haptenic sugars were as follows: 100 mM α-methyl-mannose for ConA, 200 mM galactose for PNA, 200 mM galactosamine for HAA, and 300 mM N-acetyl-glucosamine for WGA. Proteolytic activity of CGP was detected by gelatin zymography . 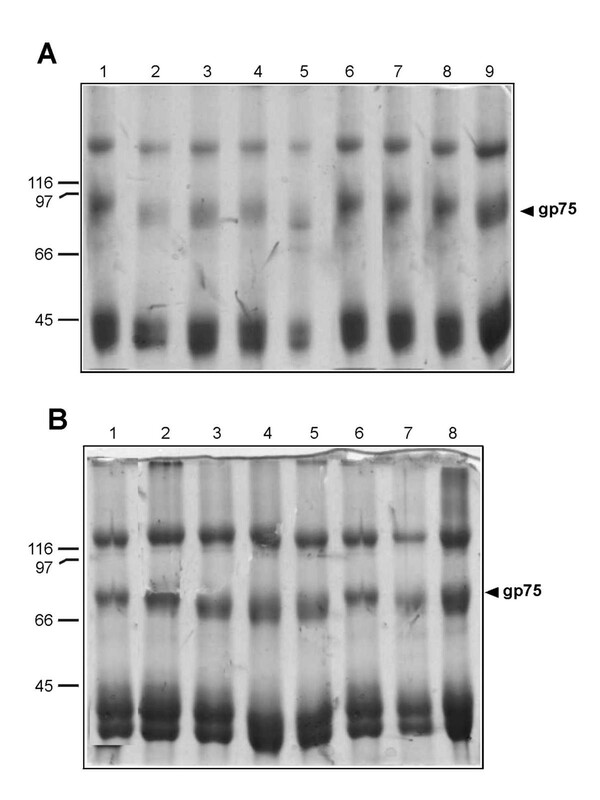 A 7.5% SDS-PAGE gel was prepared as previously described and co-polymerized with gelatin at a final concentration of 0.3%. CGP, unreduced and unboiled, was submitted to electrophoresis at 4°C. To remove the SDS after the run, the gel was soaked in 2.5% Triton X-100 for two hours at room temperature. The gel was then incubated in calcium activity buffer (200 mM NaCl, 40 mM Tris-HCl, 10 mM CaCl2, pH = 7.5) overnight at room temperature. Finally, the gel was stained with Coomassie Blue and then destained with 40% ethanol/10% acetic acid. Proteolytic activity was detected by gelatin lysis, as evidenced as a clear band. Proteolytic activity of CGP was assayed by incubating intact VE (suspended in distilled water (5 μl)) with 5 μg of total CGP protein and 30 μl Ringer-Tris for 60 min at 25°C. The VEs were then rinsed with Ringer-Tris solution and centrifuged to eliminate excess CGP proteins. The CGP-treated VE were solubilized in sample buffer and analyzed by SDS-PAGE. Proteolytic activity of CGP at different pHs was evaluated by the same procedure mentioned above, but replacing the Ringer-Tris by 10% Ringer buffered at pH = 4.0, 5.6, 7.0, 7.6, 8.1, 9.0 and 10.0. Buffers used were acetic acid/acetate (pH = 4.0 and 5.6); Tris/HCl (pH= 7.0, 7.6 and 8.1); Glycine/NaOH (pH= 9.0 and 10.0). In all cases, final buffer concentration was 0.05 M.
To characterize the protease activity of CGP, the same assay was performed in a calcium free Ringer-Tris solution or in the presence of the following protease inhibitors: 5 mM EDTA (ethylendiaminetetraacetate, sodium salt), 0.7 μg/ml pepstatin, 50 μg/ml TLCK (N-α-p-tosyl-L-lysine chloromethyl ketone), 50 μg/ml TPCK (N-α-p-tosyl-L-phenylalanine chloromethyl ketone). 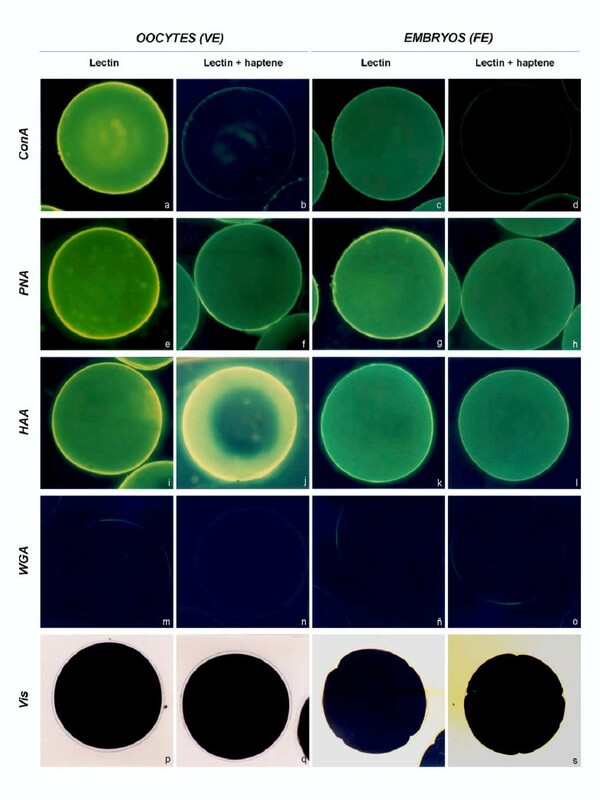 Ten to twenty dejellied oocytes or 8-cell embryos were incubated in 500 μl PBS, pH = 6.8 containing the FITC-labeled lectins at a concentration of 50 μg/ml. Incubations were carried out for 30 minutes at room temperature. The media was discarded and the cells washed three times (5 minutes each) with PBS, pH = 6.8. For specificity controls, lectins were preincubated for 30 minutes with the corresponding haptenic sugar at a concentration of 100 mM; cells were then added to the media, incubated and washed as above. The lectins used were ConA, PNA, HAA, WGA and those from Solanum tuberosum (STA) and Tetragonolobus purpureas (LTA). The haptenic sugars used to inhibit lectins in control experiments were as follows: α-methyl-mannose for ConA, galactose for PNA, galactosamine for HAA, N-acetyl-glucosamine for WGA and STA and fucose for LTA. Twenty micrograms total protein from CE, VE, FE and sperm homogenate was separated on 7.5 % SDS PAGE gels and transferred to nitrocellulose membranes. The membranes were blocked in 50 mM Tris-HCl pH = 7.6, 150 mM NaCl and 2 % BSA, for two hours at room temperature. After washing with 10 mM Tris-HCl pH = 7.6, 30 mM NaCl, 1% Nonidet P40 0.5% BSA (binding solution), the membrane was incubated for four hours with 20 μg/ml total biotinylated CGP proteins in binding solution . After washing with 20 mM Tris-HCl pH = 7.6, 0.5 mM NaCl, 20% Tween 20, the membranes were incubated with peroxidase-coupled streptavidin (20 μg/ml) for one hour in binding solution. After washed four times for five minutes in 20 mM Tris-HCl, 0.5 mM NaCl, 0.2% Tween-20, pH = 7.6, and twice for five minutes in 20 mM Tris-HCl pH 7.6, NaCl 500 mM and developed using chemoluminiscent substrates. Protein concentration was estimated with the Lowry method  using BSA as a standard. Deglycosylation of VE components was carried out with trifluoro-methanesulfonic (TFMS) acid, using a Glycofree Deglycosylation kit (Oxford GlycoSciences, U.K.), according to the manufacturer's instructions. When the CE was submitted to SDS-PAGE under non-reducing conditions, four major bands (Fig. 1, lane 3) were observed. Also, an aggregate was observed at the top of the gel. Under reducing conditions the aggregate was resolved into six major components of 120, 75, 55, 45, 43 and 40 kDa (Fig. 1 lane 2). All identified proteins are likely glycoproteins, since they were stained with PAS (Fig. 1 lane 4). Electrophoretic profile of the coelomic envelope (CE) as compared with the vitelline envelope (VE). Solubilized glycoproteins were separated on a 10% gel under denaturing and reducing (+) or non-reducing (-) conditions. Forty μg of protein was loaded in each lane. The gel was stained with Coomasie Brilliant Blue R-250 (CBB, lanes 1–3) for proteins or with the periodic acid-Schiff protocol (PAS, lane 4) for carbohydrates. Molecular mass markers are indicated on the left. Arrowheads point to distinct CE components, which are not found in the VE . βME: β-mercaptoethanol. Images are representative of four independent experiments. The proteic pattern of the VE , when resolved under denaturing, reducing conditions, presented no variations for gp120 and gp75 when compared to the CE (Fig 1 lane 1). Under these conditions, the VE contained two molecular species, gp41 and gp38 (as previously reported ) instead of gp55, 45, 43 and 40, which were detected in the CE . The transformation of the CE to VE does not seem to involve significant loss of carbohydrates from the glycoproteins of the CE , since the molecules remained PAS positive (data not shown). However minor carbohydrate changes cannot be ruled out. When the VE was analyzed by PAGE under non-reducing and denaturing conditions and compared to reducing conditions (Fig. 2B, lanes 1 and 2), a different pattern was observed. Three of the bands, namely gp75, gp41 and gp38 show an increased electrophoretic mobility while gp120 does not seem to change under non-reducing conditions. A: Electrophoretic analysis of deglycosylated components of the vitelline (VE) and fertilization envelopes (FE). Solubilized envelopes before (VE , FE) or after elimination of N- and O-linked oligosaccharides (dVE, dFE) were analyzed on a 12% gel under denaturing and reducing conditions. Forty μg of protein was loaded in each lane. The gel was stained with Coomasie Brilliant Blue R-250. Arrowheads point to the components that differ between the two envelopes. B: Electrophoretic analysis of the FE under denaturing and reducing (+) or non-reducing (-) conditions. Forty μg of protein was loaded in each lane (10% gel), and was then stained for proteins (CBB) or carbohydrates (PAS). Numbers indicate molecular mass markers. βME: β-mercaptoethanol. Images are representative of four independent experiments. When the VE was chemically deglycosylated, the resulting peptides presented a different electrophoretic mobility to that of the glycosylated proteins, as observed in Figure 2A (lanes 1 and 3). Results show that gp120 changed to gp100; while gp75 was converted to gp64, and gp41; and gp38 shifted to 37 and 31 kDa respectively. Results not shown indicate that the proteins were PAS negative. When the FE was analyzed under denaturing and reducing conditions, four major components were detected. When compared to the components of the VE , gp75 was replaced by a diffuse band ranging from 66 to 69 kDa, while the remaining bands maintained the same (Figure 2A lanes 1 and 2). Given that the FE components were stained with PAS, they likely represent glycoproteins. (Fig. 2B, lane 3). When the FE components were separated under non reducing conditions, the gp75, gp41 and gp38 bands migrate faster than the corresponding reduced glycoproteins (Fig. 2B, lanes 1 and 2). The results summarized in Figure 3 indicate that Con A binds to gp120 in the three envelopes: CE , VE and FE (Fig. 3A). This indicates that this component likely contains mannose or glucose residues. PNA staining revealed the presence of galactose (or N-acetyl-galactosamine) residues in FE gp120. Much weaker staining is also observed for gp120 in CE and VE (Fig. 3B). No other components seem to bind the lectin, indicating the absence of terminal galactose residues. Treatment with WGA revealed the presence of sialic acid and probably N-acetyl-glucosamine in all the components of the three envelopes, although a higher amount seems to be associated with gp120 (Fig. 3C). N-acetyl-galactosamine is present in all the components of the three envelopes (as evidenced by HAA binding), except for gp69 in FE , which was not stained with this lectin (Fig 3D). This could be ascribed to the loss of N-acetyl-galactosamine residues due to the activity of enzymes released from the CGs during activation. It should be noted that in this case pre-treatment of the lectin with D-glucosamine only partially inhibits the binding. This is frequently observed when binding inhibition is carried out with a monosaccharide instead of the more complex (and specific) oligosaccharide. In any case, the staining in control experiments is weaker (Fig. 3D), indicating that, at least to some extent, the lectin specifically binds to N-acetyl-galactosamine residues in the envelope glycoproteins. Lectin blot analysis of CE , VE , and FE . Solubilized envelopes were resolved by SDS-PAGE under reducing conditions (10% gels, 5 μg protein/lane) and electrotransferred to nitrocellulose. Membranes were incubated with peroxidase-conjugated lectins and developed as indicated in Materials and Methods. Controls (only shown for HAA) were carried out by incubating the lectin with the corresponding haptenic sugar prior to membrane incubation. Molecular mass markers are indicated on the left. Images are representative of three independent experiments. As shown in figure 4, ConA bound to the VE of live oocytes, indicating the presence of mannose. The VE was homogeneously labeled with this lectin (Fig. 4a). When the experiment was carried out using embryos, binding of ConA to the FE was also observed (Fig. 4c). The labeling was consistently higher in VE than in the FE . PNA bound to both oocytes and embryos (Fig. 4e,4g). As in the case of ConA, oocytes were brighter than embryos, suggesting higher amounts of galactose residues in the VE than in the FE . HAA also bound to both envelopes (Fig. 4i,4k), with the same pattern as described above. Labeling was also observed in control experiments in this case. However, the overall fluorescence associated to control cells was much weaker than those incubated with the lectin. Remarkably, the VE showed a relatively large patch with no fluorescence at all (Fig. 4j) when incubated with the blocked lectin. This was not the case for the FE (Fig. 4l), where control oocytes show a weak but homogeneous fluorescence. 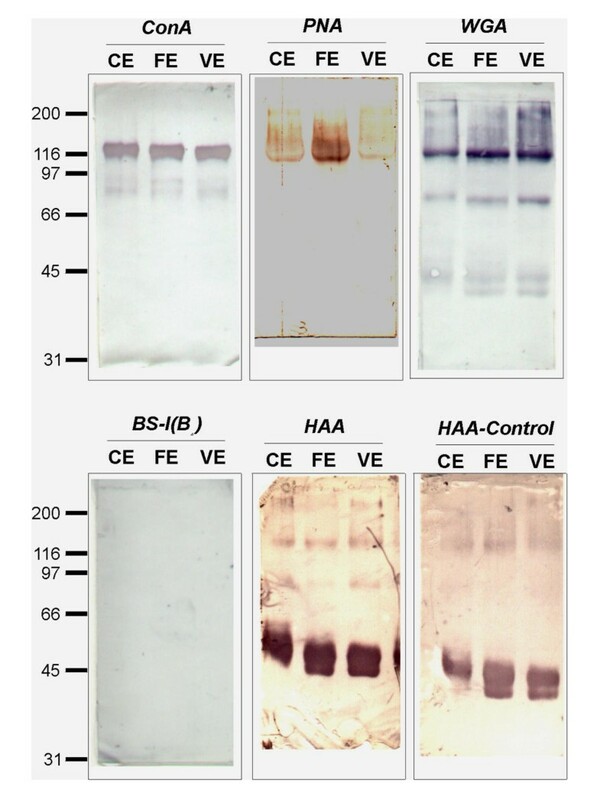 These results seem to indicate the presence of two different binding sites for HAA with a different distribution in the VE and the FE . If this were the case, binding of the lectin to one of them does not seem to be inhibited by the haptenic sugar used. WGA showed no significant binding to the VE or the FE (Fig. 4m,4n,4o,4p) of intact cells, indicating that no sialic acid (or N-acetyl-glucosamine) residues are exposed on the surface of the envelopes. STA and LTA assays were also negative (data not shown), suggesting that fucose is not present on the surface of the envelopes. Lectin binding to whole oocytes and embryos. FITC-labeled lectins were used to analyze carbohydrates on the surface of VE and FE . Ten to twenty eggs were incubated with the lectin, washed, and observed under a fluorescence-inverted microscope. Controls were carried out as for lectin blots. Results are shown for ConA (a-d), PNA (e-h), HAA (i-l) and WGA (m-p). Micrograph exposure times were the same in all cases, except for j, which was over-exposed to record the observations described. "Vis" (q-t) indicates eggs photographed under visible light. Images are representative of four independent experiments. This sensitive electrophoretic technique has been used previously to detect endoproteases. When CGP samples were electrophoresed through gelatin gels, at 4°C, two distinct bands with proteolytic activity were detected at 250 and 55 kDa. When the same samples were treated prior to electrophoresis with protease inhibitors, only the previous incubation of the CGP with EDTA abolished the proteolytic activity, suggesting that the CGP proteases are metalloproteases (data not shown). Samples of VE were incubated with CGP , and submitted to SDS-PAGE. One of the components, gp75 decreases its MW after incubation with CGP to 69 kDa. The same change was observed for FE , indicating that this difference can be ascribed to the action of the CGP on the VE (Fig 5). Electrophoretic analysis of VE (lane 1), VE post incubation with CGP (lane 2) and FE (lane 3). Total proteins, 20 μg, of VE , treated VE and FE were run in SDS-PAGE 7.5%, under reducing conditions and silver stained. VE is hydrolyzed by CGP , only the gp75 changes its electrophoretic mobility from 75 kDa to 69 kDa. Molecular mass markers are displayed on the left of the gel (numbers indicate the molecular mass in kDa). Images are representative of five independent experiments. a) Influence of pH: When VE was incubated with CGP at different pH, the proteolytic activity that rendered the change of gp75 to gp69 was only detected at pH's between 5.6 and 8.1 (Figure 6A). A, Hydrolytic activity of CGP on VE under different pH's. VEs were incubated with 5 μg of CGP (total protein) in the same conditions but different pH's. Lane 1, pH 4.0; Lane 2, pH 5.6; Lane 3, pH 7.0; Lane 4, pH 7.6; Lane 5 pH 8.1; Lane 6, pH 9.0; Lane 7, pH 10.0, Lane 8, VE; Lane 9, FE . The products were analyzed by SDS-PAGE 7.5 %. CGP shows hydrolytic activity at a pH between 5.6 and 8.1. The gel was stained with Coomassie blue. B: Hydrolytic activity of CGP on VE under different protease inhibitors. VEs were incubated with 5 μg total proteins of CGP . Lane 1, calcium free; Lane 2, 5 mM EDTA; Lane 3, 0.7 μg/ml pepstatin; Lane 4, 50 μg/ml TLCK; Lane 5, 50 μg/ml TPCK; Lane 6, VE ; Lane 7, FE ; Lane 8, AE (obtained by treating the VE with CGP) Images are representative of five independent experiments. The products were analyzed in SDS-PAGE 7.5 %. The gel stained with Coomassie blue. Hydrolytic activity of CGP was inhibited under free calcium conditions and 5 mM EDTA. b) Effect of protease inhibitors: As observed in Figure 6B, proteolytic activity was not observed in the absence of Ca++ (lane 1) or in the presence of EDTA (lane 2). The presence of aspartyl protease inhibitor (pepstatin), serin protease inhibitors (TLCK as trypsin protease inhibitor and TPCK as chymotrypsin protease inhibitor), did not inhibit the proteolytic capacity of the CGP (lanes 3, 4, 5) when compared with controls, lanes 6, 7 and 8. The results (Fig. 7) indicate that the components of CGP bind to gp120, 41 and 38 of CE , VE and FE . No label was found either with gp75 or spermatozoa. The controls indicate that components of CE , VE , FE , and spermatozoa do not show peroxidase activity (panel B). Binding of CGP to VE , CE , FE and sperm. Proteins of VE , CE , FE and sperm were resolved on 7.5 % SDS-PAGE and transferred to nitrocellulose. The membrane was incubated with biotin-labeled CGP and reveled with streptavidine peroxidase by chemoluminiscence. Components of CGP bind to gp120, gp41 and gp38 but not to gp75. No evidence of binding to sperm was observed. 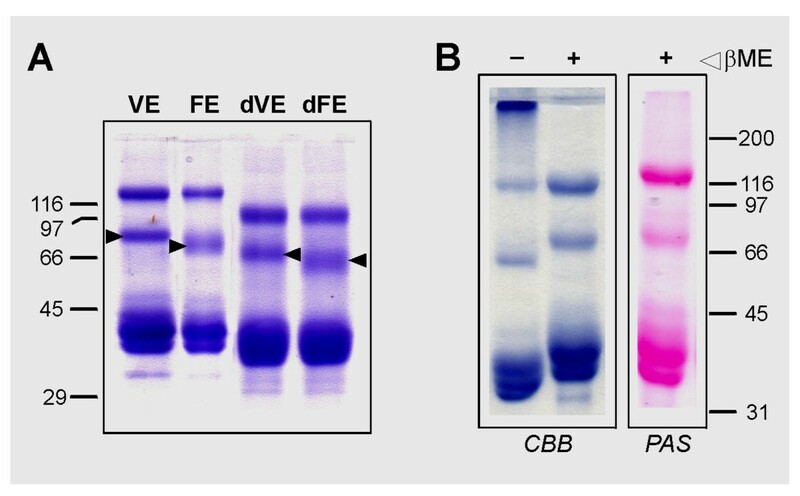 A, binding of labeled CGP ; B, negative controls; C, PAS-stained proteins. Images are representative of three independent experiments. This report demonstrates how the molecular composition of the envelopes of Bufo arenarum oocytes, differs according to its physiological status (CE , VE and FE). 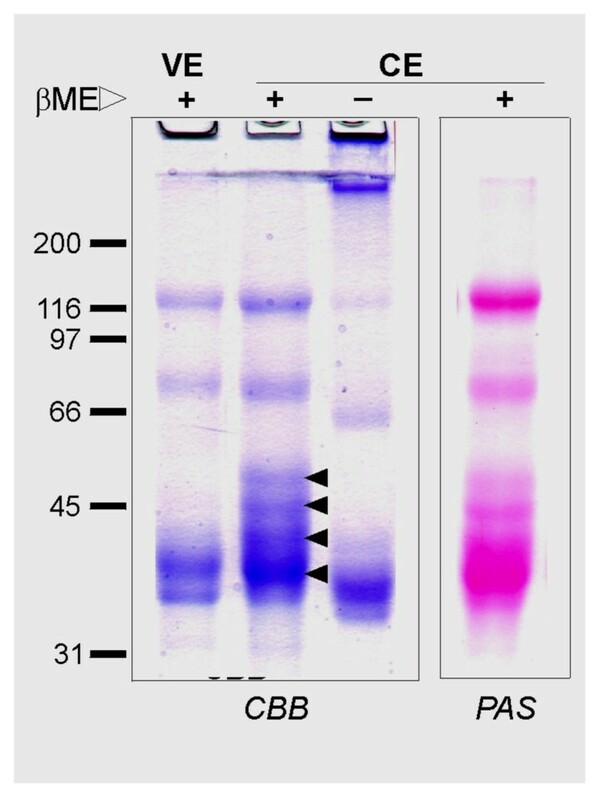 SDS-PAGE analysis of CE proteins showed, under non reducing conditions, an aggregate at the top of the gel and 4 major bands of 120, 73.5, 40 and 35 kDa. When run under reducing conditions, six major components (gp120, 75, 55, 45, 43, and 40) were observed. This likely indicates the presence of intramolecular disulfide bonds in all of the components except for gp120. Reduced glycoproteins would present a more extended conformation, thus resulting in lower mobility in gels. The high MW band at the top of the gel may be ascribed to non-specific aggregates. However, inter-molecular disulfide bonds cannot be ruled out. All the components were likely glycoproteins since they were stained by PAS. When the ovulated (coelomic) oocyte passes through the pars recta of the oviduct the CE is converted into the VE . In Xenopus laevis, the CE to VE conversion involves ultrastructural modifications and the acquisition of sperm penetrability as well as an increase in the rate of sperm binding  and thermostability . It has also been reported that the envelope glycoprotein gp43 is converted to gp41 , by the activity of a trypsin-like protease, oviductin, which is secreted from the oviductal pars recta [17, 18, 39]. Similar modifications in envelope functionality, ultrastructure, and biochemistry have been reported for other anurans, including Rana japonica , Bufo japonicus [20, 33, 40]. and Bufo arenarum . The glycoprotein pattern observed in B. arenarum is similar to that found in X. laevis, where four major components have been determined: gp120 (ZPAX), gp69 (ZPA), gp41 (ZPC) and gp37 (ZPB). As previously described, the VE of B. arenarum consists of 4 major components when analyzed by SDS-PAGE under reducing conditions (gp120, 75, 41 and 38) . In the present work, SDS-PAGE of VE components showed a molecular aggregate at the origin of the gel and 4 bands of 120, 73.5, 34 and 32 kDa when run under denaturing, non-reducing conditions, indicating the presence of intramolecular disulfide bonds in the three lower MW components. A comparison of the CE and VE envelope proteins revealed that gp120 and gp75 remained unchanged during envelope conversion. However, the mass of the remaining bands appeared to be reduced in the VE when compared to the CE , namely, gp55, 45, 43, and 40 (CE) shifted to only two bands (gp41 and 38) in the VE . This suggests proteolytic processing of these components during envelope conversion. It is also remarkable that 4 coelomic glycoproteins are apparently converted to two vitelline glycoproteins. This suggests a higher complexity of envelope components than was previously described by SDS-PAGE analysis . In particular, our data indicate that gp41 and/or gp38 are actually composed of more than one glycoprotein that co-migrate in gels. This is in agreement with the finding of multiple isoforms for gp41 at cDNA level (Barisone, unpublished results). CE and VE seem to have similar carbohydrate composition. Since proteins from both envelopes were PAS-positive, the conversion of the CE to VE seems not to involve a major loss of carbohydrates. However, minor changes, yet biologically significant, cannot be discarded. When analyzed in SDS-PAGE under reducing conditions, the gp75 observed in the VE shifted to gp69/66 in the FE . The same relative change in the molecular mass of this component was observed in deglycosylated samples, indicating a difference in the polypeptide backbone, and, therefore, a possible proteolytic processing involved in such change. Previous studies on lectin binding to oocytes showed quantitative evidence for Con-A binding sites in CE , VE and FE , demonstrating that VE binds more Con-A than CE . The passage through the oviduct somehow modifies the envelope increasing the number of these sites. In contrast, this number decreases in the FE , probably as a consequence of the action of the CGP during the oocyte activation . Here we present studies done with lectins on isolated envelopes. The presence of α-D-mannose (or α-D-glucose) in gp120 was evident for the three envelopes, indicating that this protein maintains at least these carbohydrates component in its passage through the oviduct and after fertilization. We also detected the presence of galactose (N-Ac-galactosamine) in gp120 as a weak band for VE and as a stronger signal in the FE , probably indicating that other carbohydrates are removed during egg activation, exposing the N-Ac-galactosamine to the lectin. It was possible to detect N-Ac-galactosamine (as evidenced by HAA binding) in glycoproteins from all three envelopes but the signal for gp69 was weak in FE ; possibly indicating a difference in glycosylation due to the activity of CGP on VE . The presence of sialic acid and possibly N-Ac-glucosamine was evident in all the components for the three envelopes. Lectin binding to intact envelopes (in live oocytes and embryos) resulted in an apparently different carbohydrate profile. VE and FE have binding sites for ConA, PNA and HAA, but not for WGA. These findings do not contradict the previous ones reported here on lectin blots, but rather add different information to our study on carbohydrate composition. It can be deduced from these studies that not all sugar residues present on individual components are exposed on the surface of the envelopes. Sialic acid (as revealed by WGA binding) does not seem to be accessible in intact VE or FE , although present in denatured, separated components. These findings provide interesting insight into gamete biology, since they indicate that specific sugar residues that are potentially important for sperm-egg interaction. The fertilizing sperm triggers the exocytotic reaction releasing CGP . These components modify the egg extracellular matrix, in particular the egg envelope, preventing polyspermy and providing the mechanisms for regulating the interaction of the embryo with its external environment. The incubation of VE with CGP led to a MW reduction of one of the VE components (gp75). This change seems to be similar to the one obtained when VE and FE are compared. This proteolytic activity was evident at pH's between 5.6 and 8.1 while the gp75 component was not modified at more acid or basic pHs. Protease activity appears to be conserved in the cortical granules of animals. Once secreted from the egg at fertilization, the protease modifies the extracellular matrix of the egg. 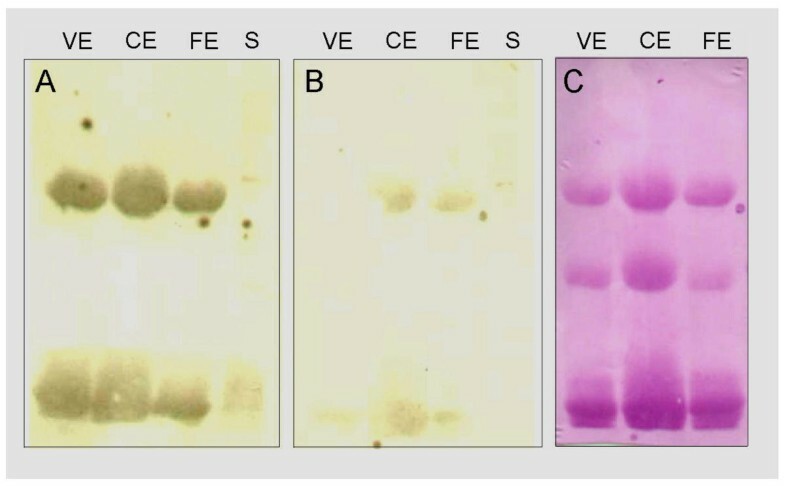 Serine proteases have been detected in the cortical granules of X. laevis  and sea urchin  oocytes; these enzymes seem to be involved in the transformation of VE to FE . We observed that serine protease inhibitors or aspartyl protease inhibitors did not affect the proteolytic activity of CGP in B. arenarum; however, this activity was suppressed in the absence of Ca2+ or in the presence of EDTA. Although we cannot exclude the possibility that other types of proteases are present in CGP of B. arenarum, our findings suggest that the conversion of gp75 to lower MW species involve metalloprotease activity. This work was supported in part by research Grant 802/OC-AR from Consejo Nacional de Investigaciones Científicas y Técnicas (CONICET), Fundoción Antorchas Consejo de Investigaciones UNR and the ANPCyT-BID Program of Argentina (PICT N° 01-08545) awarded to MOC.